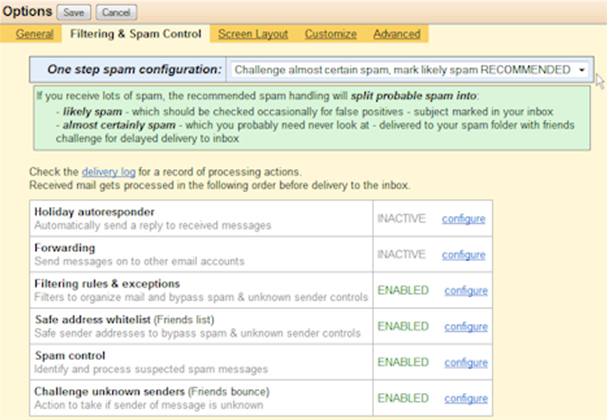 Mark probable spam and deliver to Inbox - Prefixes the subject line with [Spam: score] if 6 or higher. Challenge almost certain spam, mark likely spam - This will mark the subject of probable spam for identification but also move messages scored 10 or higher into the Spam folder, challenging the senders. Unless you receive little spam, we recommend using #4. This not only allows for catching false positives easier, but also challenges the senders of any email moved to the Spam folder. If a human response is received back from a challenged sender, the message is automatically moved back into your Inbox and the address is also placed into your Friends whitelist, not to be challenged again. Whichever setting you choose, any new addresses you email will be whitelisted automatically. More details on the Friends Challenge-Response System and its modes of operation can be found here. Any of the above pre-configured settings can be selected within the Standard interface by going into Options, Preferences and then clicking "Filtering & Spam Control".